Pokemon Go is a very time-consuming game. So, it makes sense that some would want to try out other ways to play Pokemon Go. 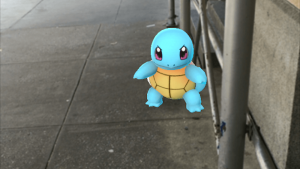 If there is one lesson to be learned from Pokemon Go augmented reality mobile video game’s success, it’s this: any video game that pits players against each other to level up higher and faster is going to get a lot of attention. And there is little doubt in the fact that Pokemon Go players have gone to insane lengths in ensuring that their PokeDex is better than their friend’s. From quitting their jobs to making eight hours trips for rare Pokemon Go monsters after work; we have seen it all when it comes to getting better and bigger in Pokemon Go. And who can forget that special Pokemon Go player who committed to travel the whole world in search of every Pokemon Go monster that Pokemon Go has to offer? And that’s not even counting the ones who have spent thousands of dollars to purchase extra battery packs for their smartphones in order to play Pokemon Go for longer periods of time and maintain a good charge. There have also been Pokemon Go players who have stumbled on dead bodies and fallen off cliffs in order to catch that special Pokemon Go monster. And how about that crazy report where a Pokemon Go player stumbled off a pier while trying to line up the perfect shot to catch a Pokemon Go monster. But there is another group of Pokemon Go players that has taken the “soft” approach in getting ahead of others as far as Pokemon Go trainer level is concerned. Pokemon Go players who feel at home with technology have harnessed the power of the always on broadband internet to create their own methods in order to game the system and basically “insure” their success rate in Pokemon Go. Not all of those methods can be labeled as “white” though. There are always those players who like to cheat the game mechanics of a particular game and try to bypass its progression system. Pokemon Go is no exception as Pokemon Go players have used all means that they have deemed necessary to become the ultimate Pokemon Go masters. The techniques and methods we’ll describe here have been used most easily on the Android version of Pokemon Go, though the iOS version of Pokemon Go isn’t immune to these “cheats” either. People have found cheating on the Android version much easier than on the iOS. So it’s better if you use these on Android to save yourself some time. Do keep in mind that TechnologyPep does not condone the use of any application that is developed by a third party studio which is designed to bypass Pokemon Go progression system. We recommend that you do it the right way by following our tips and guides. Not only does that break the game but it also goes against the spirit of Pokemon Go game’s design. And then there is the fact that if you do end up using any of these third party apps, you expose yourself to a lot of safety issues. Needless to say, you should cheat at your own risk. Of course, you can always spend some more time studying how to get better at playing Pokemon Go. Without a doubt, there are literally millions of Pokemon Go players out there who are trying their absolute hardest to build up their Pokedex. As mentioned before, some players have gone to ridiculous lengths in ensuring that they get leveled up quickly. Below you’ll be able to read the top five ways that PoGo players are cheating at PoGo. Granted that Pokemon Go augmented reality mobile video game doesn’t have a particularly robust mapping tool; Pokemon Go players are forced to look for other means in order to track down rare Pokemon Go monsters without spending their whole weekend playing Pokemon Go. There are no street names in the default Pokemon Go map tool and the only way to ascertain if a particular location is a Poke Stop is to select that Poke Stop and read the respective description. As you can imagine, reading isn’t much fun when you’re trying to catch PoGo (Pokemon Go) monsters as quickly as possible. Apart from getting really lucky, there really isn’t a single sure-fire way of knowing exactly where a Poke Stop is located or how far away a Poke Stop might be from your current location. Hence, finding Poke Stops can become a huge issue for some PoGo players. The solution, a lot of PoGo players, have chosen to implement, is to use a Pokemon tracking tool. Many aspiring developers have managed to create Pokemon tracking tools that are free to download and use. Most of these applications use Google Maps in real time and are able to locate Poke Stops and Poke Gyms accurately so that PoGo players can spend time doing what they love to do: catch more Pokemon. Applications like PokeTracker, which has been taken down now, went so far to actually highlight specific areas where certain Pokemon spawned. It sent users, alerts regarding Pokemon that were nearby and where exactly they could be found. Technically, that could be considered as cheating. After all, PoGo is supposed to be a mobile video game where the objective is to go out in the real world and wander off into the wild. It encourages players to explore and stumble on PoGo monsters rather than zero in on PoGo monsters. But in the defense of this application, it does force PoGo players to move and hunt down PoGo monsters once their locations have been confirmed. If you think about it, it isn’t too far off from what the developers intended for PoGo. Some Pokemon Go Players Use Automated Bots. There are always those PoGo players who don’t want to or are unable to put in any sort of work in catching PoGo monsters. But these player do want to “catch ‘em all”, and for that purpose, the internet provides them with dedicated groups of bots which play the game all day along instead of the human PoGo player. The bots send false data to PoGo servers and are able to become virtual PoGo monster hunting machines. Bots can easily capture Pokemon, hatch eggs and duplicate items that are found in Pokestops. So if you want to turn your PoGo game into an idle one then go ahead and use automated bots. Be warned though. Using bots will take annihilate the “Go” in Pokemon Go, and you won’t be able to enjoy the fundamental elements that are part of the core gameplay of PoGo. So if you’re healthy and don’t want to work for your PokeDex, then you can play PoGo with bots. Though technically you won’t be playing PoGo at all. Introducing: the Black Market of Pokemon Go. Calling this technique as “black market” maybe a bit too harsh but what else would you call a scenario where some PoGo players make some extra money on the side by selling their PoGo accounts to “needy” PoGo starters. This technique is akin to using an automated bot. The only difference here is that, you get instant PoGo credibility without ever having to put in hundreds of hours of toil. There are several places where you can engage in such a transaction, but if the PoGo accounts page on Facebook is anything to go by, then you can get yourself a PoGo account from the comfort of your screen. Users share their PoGo account details and describe their trainer levels along with the number of rare Pokemon they have in their Pokedex and how much Stardust they carry. And you don’t have to break the bank in order to buy one of these. People have listed some accounts for as low as $15 while there are other more expensive options where PoGo accounts have a much larger Pokemon collection. Everybody wants to be a Pokemon Go master. No one wants to put in the work. Congratulations, you’re at the right place. Standard PoGo augmented reality video game doesn’t offer much in the way of social interaction. The only way for PoGo players to interact with each other is to actually go outside, meet and talk. Pretty standard stuff. But now new messaging applications have surface that allow PoGo players to communicate with each other from within the game itself. One such application is called MessGo. This program grants players the ability to message trainers that might be nearby. It allows PoGo players to chat with each other about “nearby” Pokemon, their own Pokemon collection and enables players to team up and catch Pokemon more easily. Additionally, the app also allows players to get leads on the location of rare Pokemon spawn points. Players can also organize into teams to take down an opposing team’s PokeGym. PoGo, despite Niantic Labs best efforts, has become a social phenomenon and applications like MessGo do enhance that feature. So maybe this isn’t a cheat after all. If you really want to break the system, then you can play PoGo through desktop emulators. This isn’t as popular a choice as some of the ones that have been described above but nonetheless, some players do use it. Clever PoGo players have figured out how to start PoGo right from their desktop computers or laptops. All it requires is for you, the user, to install any Android emulator along with a fake GPS feed info to PoGo servers. Once users have completed these steps, they can use the emulator and the fake GPS info to trick the game into taking them anywhere on the map. You can easily imagine how easy it would be to catch Pokemon when you can move around the whole map instantly. In fact, using this technique, you can catch every Pokemon in the entire universe (though currently PoGo is only available on planet earth). The fake GPS info feeds PoGo servers with false information about the location of a particular PoGo player, and the rest is left to the program to sort out. Your experience of PoGo will probably be wrecked if you do decide to try this method out. PGo is an augmented reality mobile video game that is designed to be played through walking and traversing. It is a “mobile” game. With that said, using a desktop emulator doesn’t actually kill the game. PoGo is still pretty playable on a desktop because the emulator, for all its faults, enables you to perform the most fun part of the game: catch all Pokemon in the least amount of time.